Most of the time when I go to the farmer’s market, I stick to vegetables with the occasional purchase of honey, cheese or rice, and limit my interactions with the meat and egg vendors to longing glances. As much as I would love to make a habit of buying locally raised, pastured animal products (our farmer’s market carries lamb, beef, pork, chicken, turkey, and eggs), I just don’t carry that kind of cash around—if I did, my monthly food budget would be blown in the blink of an eye. I talk myself into an extravagant purchase every so often, however: a pair of lamb shanks here, a dozen eggs there, or the oxtails pictured below. Note that I went for the least expensive proteins possible. Due to their market scarcity, I have only cooked with oxtails once before, a rather memorable day for me but not on account of the ragu. Those were enormous specimens; the local ones I worked with this week were much smaller, sliced through the joints but still intact enough to handle as a single unit while searing, a handy feature. They simmered for probably 6 hours in a bath of tomatoes, onion, garlic and green pepper, red wine and a bit of chicken stock, until the meat literally fell off the bones—removing them was a bit of a fishing expedition, especially for these unidentifiable little bone “buttons” that separated themselves from every single vertebra. I didn’t use a recipe, but winging it based on fundamental braising principles produced a fantastic result. While the ragu reduced further, I made a batch of potato gnocchi and roasted some beans. 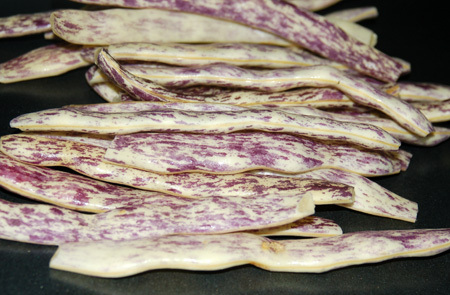 These striking beans from Minto Island Growers were labeled as dragon beans. I’m not sure if they are a young version of the rattlesnake or dragon’s tongue shelling beans I wrote about last fall, but their look is very similar. In this case, however, the actual beans are still underdeveloped and the pods tender enough to eat whole, much like a dandied-up romano bean. After roasting in the oven, they came out ivory-colored, with just a few remaining wisps of purple and lots of lovely crisp browned spots. The oxtail ragu was excellent, very savory and packed with tender shreds of beef. It was rich enough that a little went a long way, so after eating our fill, there were still several cups to store for later—a good way to stretch out an inexpensive cut of quality meat. My gnocchi were passable. They looked good and were fairly light, but the potato version always falls a distant second to fava or ricotta gnocchi in my book. The recipe was Marcella’s , which uses only potato and flour (no egg binder), and it made enough gnocchi that I had a plateful to freeze for later, a mixed blessing. The stars of the meal, for me at least, were the roasted dragon beans. They emerged from the oven creamy inside, crisp in spots outside, and pleasantly salty with a subtle hint of garlic. Actually, they reminded me very much of French fries, only superior nutritionally. I ate them with my fingers, imagined them piled up next to a juicy burger, and wished I had bought more than a measly half-pound. It was almost enough to make me feel bad that I hardly gave that lovingly cooked ragu and its handmade gnocchi a second thought. This post is linked up with Two for Tuesday and Tuesday Twister. Preheat oven to 450F. On a large rimmed baking sheet, toss the whole beans with the oil, salt, garlic powder, and a few grinds of pepper. Spread the beans out in a single layer. Roast for about 15 minutes, turning once, or until the beans are tender and browned. Serve warm or at room temperature. Source: Slightly adapted from Boston.com. 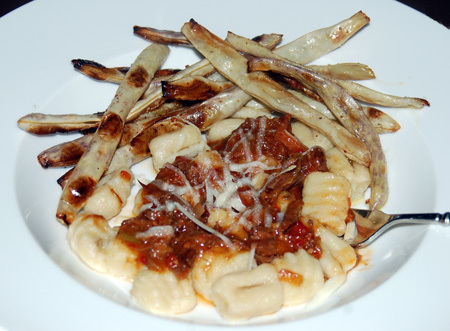 I have never cooked oxtail myself…..sounds really great to serve with handmade gnocchi! I think I’m going to omit the oxtail and eat the rest on the plate! haha…. Even I’m not a big fan of the oxtail but the pasta looks as lucious. Thanks for sharing & have a nice day. Kristy, next time I make gnocchi, I think I am going to pan-fry it in a little butter like I always do with spaetzle. I think that would improve the texture for me personally, maybe even using a compound butter to impart more flavor. Thanks for visiting the site! I could honestly devour that whole plate right this instant. It all looks so delicious. Thank you for sharing with Two for Tuesay. I haven’t cooked oxtail, but we love gnocchi, so I’m game to give it try. I bet my family would love it. 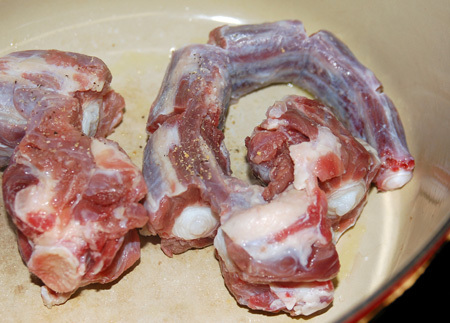 I have oxtail in the freezer, just waiting for a recipe like this – yum yum yum! Actually the whole meal looks delicious! thanks for linking to Two for Tues!